"My former Physio Bill Preston who encouraged me greatly to play the game during my initial rehabilitation at Stoke Mandeville took this photo during the 1963 National Stoke Mandeville Games. This was held in the Archery Unit hut in the Hospital. How things have moved on since then. Now of course the wheelchairs are so different and everyone would be in tracksuits." "Some of the bats then had some sponge but the bats now have much more sponge in them to increase spin. I played with a plain pimpled Johnny Leach bat that took off the opponents spin, much to their frustration! I think it also meant my smashes were harder. Now of course competitions like this are played in Sports Centres with table surrounds and ball boys etc.but it all had to start somewhere and then evolve. The tables at least are the same!" 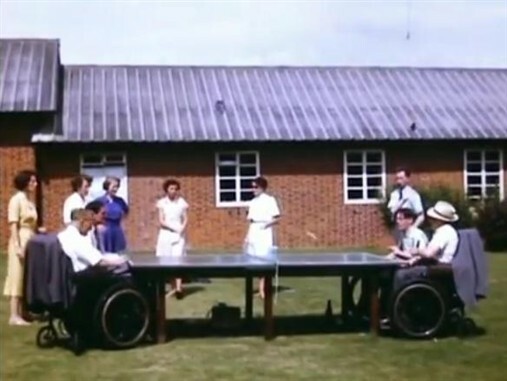 "One of the physios at Stoke Mandeville, Bill Preston, was a good league table tennis player and he spotted that I was a good player despite my high level lesion. Sometimes he would come back in the evening to practice table tennis with me so I got pretty good. He started talking to me about the forthcoming Olympic Games that were to be held in Tokyo in 1964; how it would be a hell of a trip and that I should try and get onto the team; but how in order to do that I would need to compete and win at the National Games earlier in the year. Only the top two players would be in the team; I needed to get to the finals of the National Games at Stoke to stand a chance. Well I played Tommy Taylor in the quarter finals; he had won Gold at Rome in 1960, but I beat him, but lost the final to Paul Lall. So come the end of the National Games Guttmann and the head physios got together to discuss who would be in the team selection for Tokyo. Apparently Miss Bell said that she didn’t think Philip should go because he was really a Cervical class, but Guttmann said to her, “Zis boy, it would be good for him. Zis boy will go.” And of course what Poppa Guttmann said went. He liked the British team to be as big as possible and he also made a point of trying to send higher lesion competitors as part of the team; so Tommy Taylor, John B, Paul Lall and myself were all in the team in the end. At Tokyo I ended up getting beaten by Schumaker from Holland in my first singles game and John and I went out in the second round of the doubles to the Germans. But in spite of that the whole experience was quite amazing." "So I went into a handicapped home. It was the only one in Switzerland at the time and it was the other side of the country and a nine hour drive from my step-parents. Also it wasn’t just for disabled people but included people with all different sorts of physical and mental handicap. I had my own room there, a physiotherapist and a job paying 5 francs a week; and basically I lived there for the next 12 years. Every day there I played table tennis. 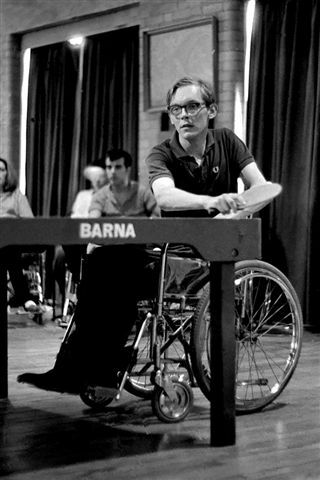 I saw it as my way out of the ghetto of disability, my ticket back into the world. I lived for the next game, the next tournament. I only thought about training, playing, getting into the next ranking. I made it into the national team and then got to go to international games." This page was added on 15/11/2013.